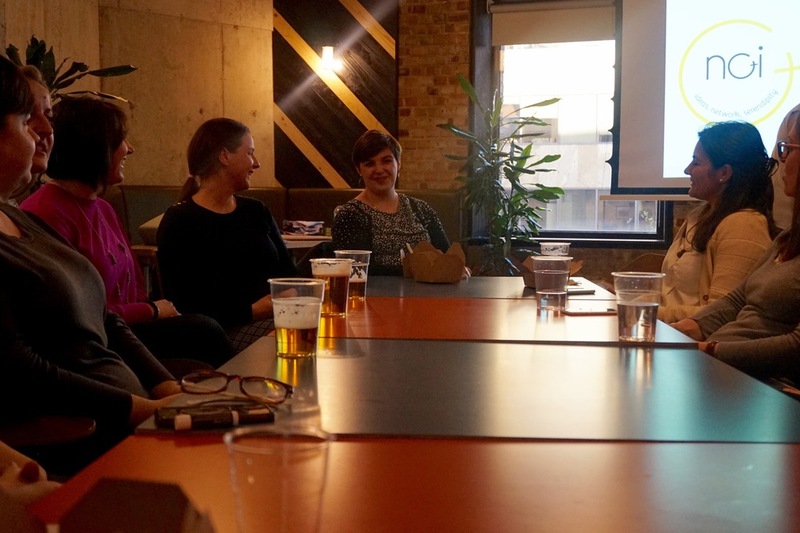 NOI ladies gathered at WeWork Devonshire Square on 19th April for ‘work net’. Staying true to NOI’s mission and core values, work net provided a supportive space for members to take their business projects forward. We were delighted to hear from two very different but equally pioneering founders; Sharon Maddy-Patel, a shoe entrepreneur about to disrupt the shoe industry with her innovative new high heel designs serving comfort and style and Abi Childs, co-founder of ethical fashion brand Samanata Yogi. Work net was part focus group, part creative design brainstorm; during the session Sharon and Abi took turns to share their startup story and explore the wants and needs of their target audience. It was a great lesson on how to create the perfect setting for gathering audience insight. - Sharon was super skillful in asking open questions about the group’s preferences around footwear. She was interested in the feelings wearing heels evoked, physically and psychologically, e.g. “Not only do heels make me physically taller, they can make me feel more assertive in social and professional situations.” This wasn’t just about surveying a demographic, it was about gaining an understanding of the woman as an individual, discovering her nuanced worldview. - Sharon was interested in hearing more about significant moments we had experienced whilst ‘in heels’ e.g. celebratory occasions, job interviews, important meetings. The sharing of anecdotes, funny and informative, naturally flowed from the group. It helped her appreciate potential customers’ pain points and the benefits her product could bring. - Samanata Yogi’s creative inspiration behind each collection is intertwined with their sustainability ethics. They are committed to collaborating with various artists representing cultures across the world. Co-founder Abi asked for ideas on what creative themes we’d like to see printed on future collections. Taking things a step further, we got our creative juices flowing by working together to make mood boards featuring colours, images and words that represented the ideas we had just shared verbally. Not only did participating in this process produce a visual record of our creative desires, but it was simultaneously empowering for the group to have a hand in planting the seed for designs that might inspire a future collection. We’re looking forward to the next NOI event where we celebrate its first birthday!